In the second of our guest blog posts, Dr Andrea Sottoriva describes how a comparison between the expanding universe and the growth of cancers led him to formulate his “Big Bang” theory of tumour growth – a model with novel treatment implications. In 1929 Edward Hubble, sitting at the top of Mount Wilson, observed that stars and galaxies are moving away from each other. He reasoned that, if stars are continuously moving apart, they must have been closer together at earlier times, to the point that at the very beginning the entire cosmos would have been compressed into a tiny space. This led to the hypothesis that our universe could have originated from a cosmic explosion, “the Big Bang”. But where are the remnants of such an enormous blast? Surely such a phenomenon must have left its mark in today’s universe? In fact, it did. Radio astronomers, Arno Penzias and Robert Wilson, detected the Cosmic Microwave Background radiation in 1964. 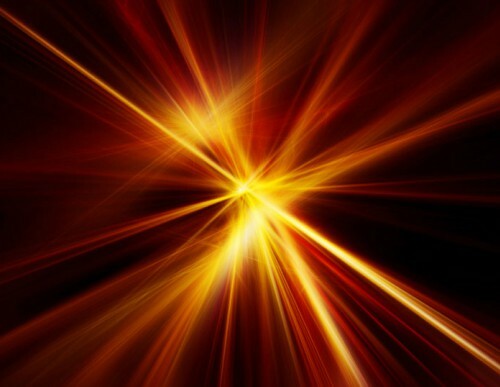 This is the glow of the Big Bang explosion, it permeates the whole universe at an almost uniform -270 degrees Celsius. So, what does all of this have to do with cancer? Tumours are large collections of cancer cells that grow out of control and invade healthy tissue, thus becoming life-threatening. Like the universe, cancers expand from something tiny, a single tiny cell. By sequencing the DNA of tumours we discovered that each cancer is unique to a single patient, in the same way that the universe is unique, as far as we can tell. As in the case of our universe, we do not have the power to go back in time and directly observe how a tumour started because unfortunately most tumours are detected at a late stage. However, if we could understand the origins of these cancers and how they evolved over time — from the first cell until today — we would be able to design much better treatments, tailored to the individual person. But do cancer cells preserve clues on how they originated and how they grew? And can we develop techniques to decipher this information from full-blown cancers? Recent evidence indicates that there is genetic variation not only between patients, but also among cells of the same tumour 1. Tumours are no longer seen as uniform, but rather as a collection of distinct subpopulations of cells often called “clones” 2. This diversity is a big challenge for tumour treatment, as a therapy may only work for a subset of cells in a tumour, thus making its complete eradication impossible. In a recent study published in Nature Genetics 3, we have investigated whether the patterns of diversity in a tumour could be exploited to capture the unique evolution of that cancer, much as concentric rings in trees encode the information on their growth. If they could, this would provide a unique opportunity to trace back each tumour to its very inception. Our study focused on colorectal cancer, the fourth most common cause of cancer death in the UK. We made maps of the genetic variation emerging in different areas of each tumour and posed the question: what caused the specific distribution of genetic variation we observe in each independent area? To address this, we first measured the degree of variation across different tumour regions and discovered that, although the single mutations in the genome were different, the amount of variation was similar. Therein lies another parallel with astronomy. When Penzias and Wilson discovered the Cosmic Microwave Background they looked very far in one direction, and found scattered radiation at 3 degrees Kelvin. To their astonishment, when they looked in another direction, they measured the same temperature. How could this happen in two regions in space too far apart for light to connect them? Similarly, in a large tumour, composed of billions of cells, we found distant areas with the same amount of variation, but again, how could distant population of cells be ‘connected’? As for the universe, the answer was in the tumour’s origin. Seemingly disconnected regions in space would have been connected at the very beginning, during its most compressed phase. For the tumour, the overall genetic variation was similar because of the uniform expansion of the tumour. The tumour was already “mixed” at its origins, and this genetic mixture simply propagated during the expansion of the malignancy, in the same way as the Cosmic Microwave Background propagated through the universe as it expanded. Crucially, in both cases, current observations allow us to reveal the origins of the system. We formulated the “Big Bang” model of tumour growth in which the cancer grows as a single expansion populated by a large number of intermixed clones. We used the term because this model implies that a signature of the early origins of the malignancy can be recovered from the present day tumour, in the same way that the Cosmic Microwave Background represents a signature of the birth of our Universe. We believe that understanding the origins of a cancer in each individual patient is key to designing new treatment modalities based on a solid mathematical framework that we hope will lead to rigorous predictions and personalised therapeutic strategies. Burrell RA, McGranahan N, Bartek J, Swanton C (2013) The causes and consequences of genetic heterogeneity in cancer evolution. Nature, 501(7467):338-45. Greaves M, Maley CC (2012) Clonal evolution in cancer. Nature, 481(7381):306-13. Sottoriva A, Kang H, Ma Z, Graham TA, Salomon MP, Zhao J, Marjoram P, Siegmund K, Press MF, Shibata D, Curtis C (2015) A Big Bang model of human colorectal tumor growth. Nat Genet, 47(3):209-16. An elegant, clear and thoroughly approachable guest post from Andrea Sottoriva which I have been pleased to link to from by blog. Time travel back to origins in both cancer and the whole universe! This is a lovely model and contributes much to a new understanding of the early origin of tumor heterogeneity. I would just comment that evolutionary biology teaches us that at a mechanistic level there are two genomic processes that would give rise to the genetic novelty upon which selection forces might act in the local tumor microenvironment to give rise to the heterogeneity postulated in the model. Firstly mutations in both nDNA and mtDNA are a primary mechanism and such tumor cells would have 2n diploidy for the most part and have formed the basis of the somatic mutation theory for many years but to my mind represent only part of the story. 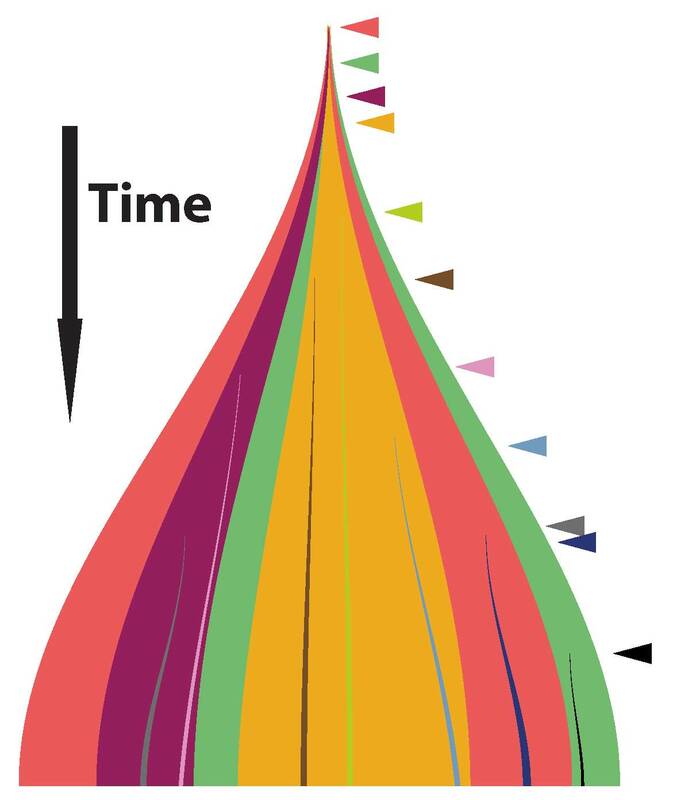 Just as important ( and responsible for tumor cell lineages with loss of heterozygosity, gross chromosomal rearrangements and aneuploidy not 2n lineages) are recombination events between homologous chromosomes or more importantly between non-homologues that gives rise to new combinations of hundreds of genes simultaneously and alterations in their expression levels creation of new genes by fusion events and dearchiving of genes silenced since embryogenesis and organ formation (dedifferentiation). So my comment speaks to the mechanistic and kinetic nature of the heterogeneity suggested in the Big Bang model. To my mind such heterogeneity does not only arise with very early events but is ongoing ie with each turn of the cell cycle with the generation of new mutation and recombination events. Such genomic instability in both the nucleus and mitochondrion giving rise to chaotic gene expression patterns (not stochastic) and resultant heterogeneous tumor cell populations over time and favoring those that have adapted to survival in a hostile human host environment as a developing pathogenic entity.